Anthony Renzulli and other guests speak with students at Al-Mazhar Girls High School. Building educational opportunities for the children of the Eastern Province, the US Indo-Pacific Command (INDOPACOM) renovated two schools in Nintavur and Soodaikkudah. 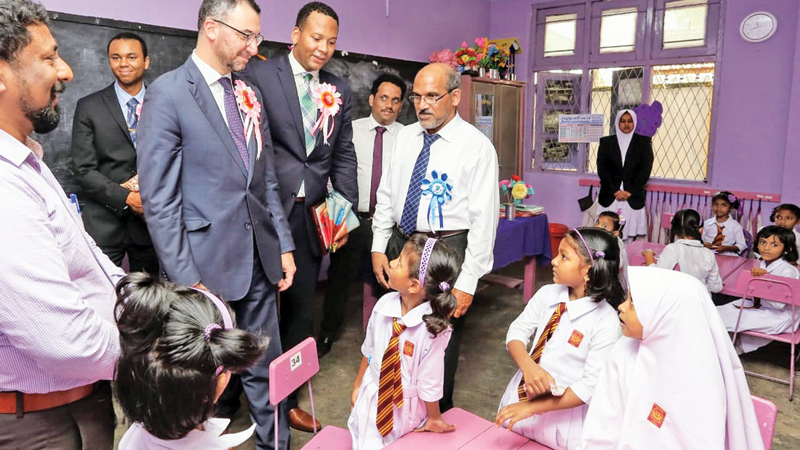 The US Embassy’s Head of Political Affairs Anthony Renzulli presided over the opening ceremony in Nintavur on Tuesday, while Public Affairs Officer David McGuire inaugurated the school in Soodaikkudah yesterday. Also participating were Eastern Province Governor M.L.A.M. Hizbullah, State Health, Nutrition, and Indigenous Medicine Minister Faizal Cassim, Eastern Province Education Secretary I.K.G. Muthubanda, Eastern Province Provincial Education Director M.T.A. Nizam and Zonal Education Director and Soodaikkudah Barathi School Principal Sivasubramaniam Kirupathas. INDOPACOM invested more than Rs. 190 million in these construction projects that directly benefit rural and under-served communities and engaged local school administration officials as partners in the construction, supporting local development and contributing to the education and future of Sri Lankan youth in Eastern Province. The INDOPACOM construction project at Al Mazhar Girls High School added 12 classrooms, a 35,000-litre rainwater harvesting system, and 17 additional bathroom stalls. At the Soodaikkudah school, INDOPACOM funded the construction of five new classrooms and a 35,000-litre rainwater harvesting system. The classroom building incorporates an emergency shelter on the top floor, providing a safe location for local families in the event of a natural disaster. This project also created a new handicap-accessible toilet block with 10 stalls. These renovations illustrate the strong and enduring partnership between the United States and Sri Lanka and represent the commitment of the United States to continuing a close relationship with Sri Lanka in the future.